The battle for the World title was an exciting one this year, as a two-time reigning champion and a first-time candidate duked it out in the hopes of claiming the 2016 crown. Coming off winning Olympic gold a month before Mexico, Jorgensen had the momentum, also knowing that she had won rights the last two years to call herself the fastest woman in triathlon. She was sitting second in the Columbia Threadneedle rankings and earning the title once again would have made her a three-peat defender, an accomplishment no elite woman has ever done in the history of the Series. 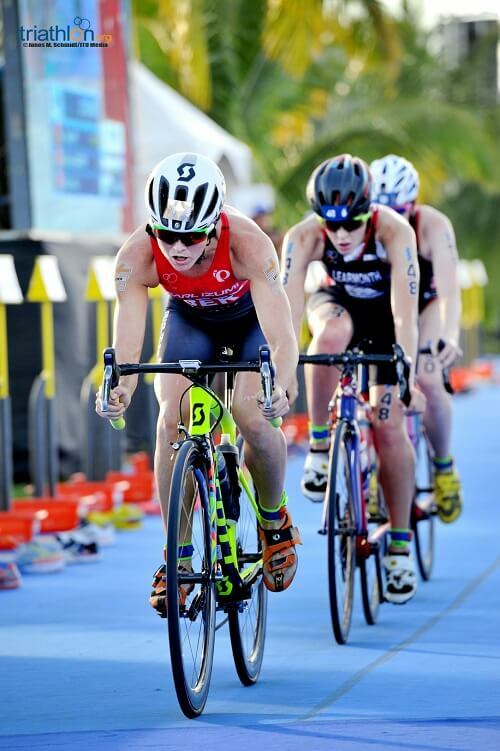 But Bermuda’s Flora Duffy had been the woman on top this season and she had no intention of giving that up. Duffy had never won the overall title before and after her season’s accolades, the title was well deserved. Only 166 points separated Duffy from Jorgensen, which meant that the race was a close one. 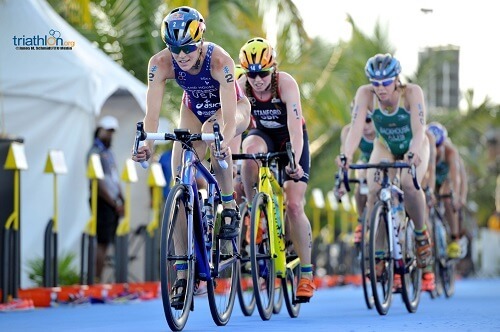 In order for Duffy to be crowned World Champion, she needed to finish first or second in the race. Then on race day, while the rivalry was heated up between the two women, the cards fell into Duffy’s lap. She delivered a flawless performance from start to finish and on her signature biking ride, she put up enough distance between her and running talent Jorgensen that she was never touched and Duffy won the title that day. But the showdown leading into the race is the reason that these two desrved to be recognized as our “Best of 2016” Women’s Showdown! 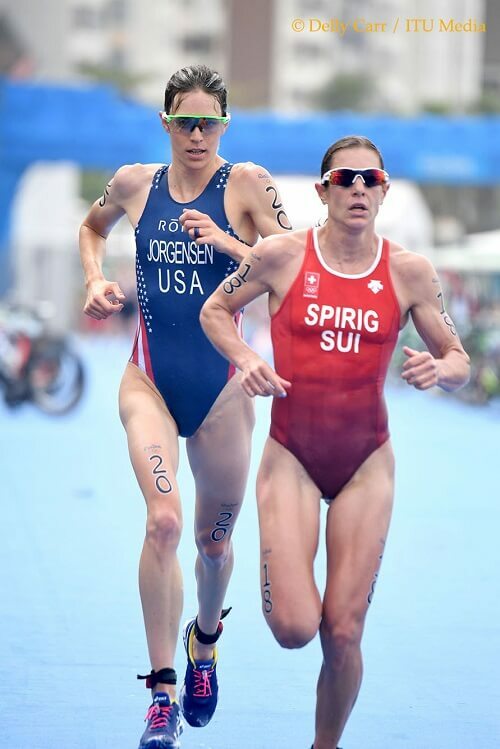 America’s Jorgensen cemented her place as one of the best triathletes of her generation, with a strong all-around performance and her killer run kick that delivered her a Gold in the triathlon event at the Rio 2016 Olympic Games. After positioning herself in the lead group from the start of the event, Jorgensen broke away from Switzerland’s Spirig on the final run lap to claim the win in 1 hour 56 minutes and 16 seconds. Spirig, the London 2012 Olympic Champion, took silver. It meant she became the first woman to win multiple Olympic medals in triathlon in doing so. And while that became the outcome, the race itself was a showdown between the two triathlon icons that left everyone on the edge of their seat. It wasn’t until the final lap that anyone knew who would come out on top. Once the two left the second transition, they found each other and were running side by side with no signs of either one being able to pull away. Then there was a moment that everyone watched on the screen as the two exchanged some words, the moment that changed everything for Jorgensen. But the games played in Jorgensen’s favour and she kicked it in gear to win the gold! But that run showdown will go down as one of the best head-to-head showdowns the sport had ever seen!